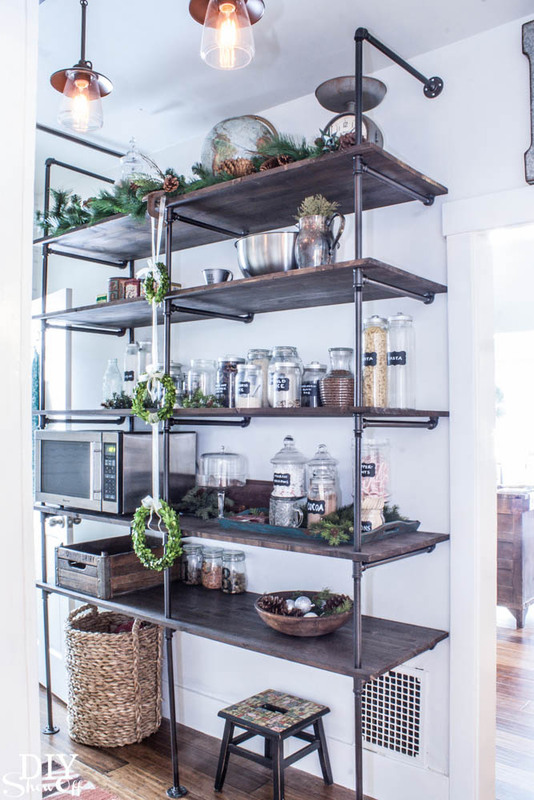 If you spend any time reading DIY and decorating blogs -- or "building" a dream home on Pinterest, like I do -- you have no doubt seen a slew of industrial pipe shelving projects. They're quite popular recently. 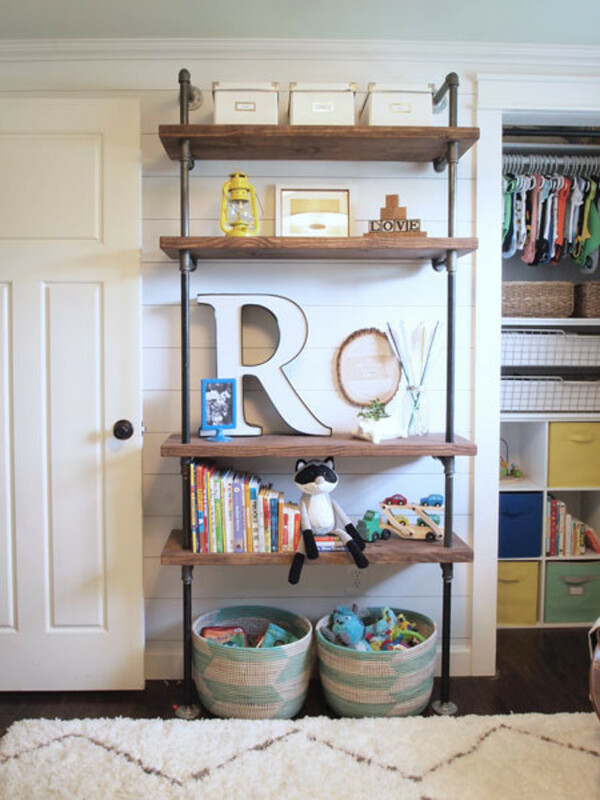 I absolutely love the look and I knew the first time I saw a pipe shelving unit that I was going to build one in my boys' bedroom someday. We FINALLY got around to doing it this summer! I'm not going to reinvent the wheel by writing a detailed tutorial myself -- Beneath My Heart has the fantastic tutorial I followed myself -- but I will share some of the things we learned along the way. I started this project the same way I start most projects -- by planning it out roughly to scale on graph paper. 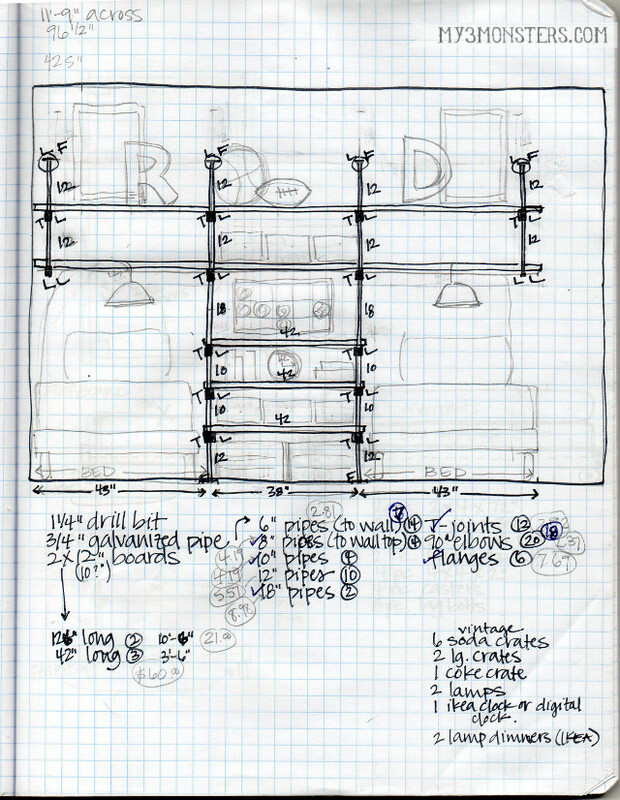 This helped me get a good idea of the layout that would work in the space. Of course, my actual shelving unit ended up a little taller than the drawing because I did not account for the height the joining pieces would add. Be sure you leave yourself plenty of "wiggle room" at the top as you plan. Using my plan, I figured out how many of each size pipe and type of joint I was going to need. 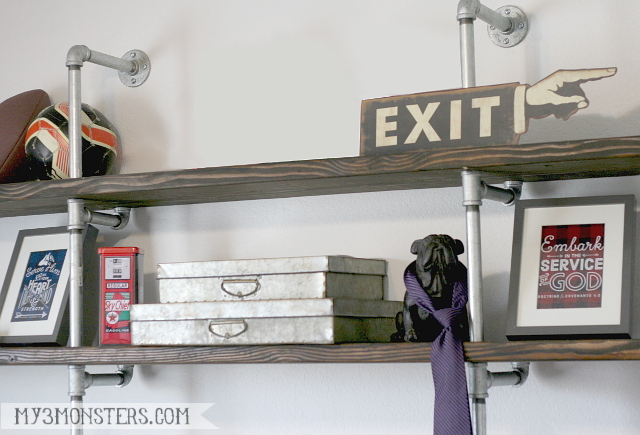 I used 3/4-inch galvanized plumbing pipe and 2 x 12 -inch wood boards. Some of the tutorials I saw called for thinner pipes and shelves, but I really the think the thicker pipe and wood are worth the extra money. I feel like it makes the shelves look far more substantial. You will not believe how quickly they come together! It took us less than 2 hours to complete this unit one evening. Just make sure to use a level so things stay straight and you'll have no problems. I'm still looking for a few more cool things to fill in the blank spaces. I'm thinking a globe, a giant basket for shoes under the bottom shelf, and an old Coke crate should do the trick. I also think it needs a plant or two, but the boys have forbidden me to make it "girly". 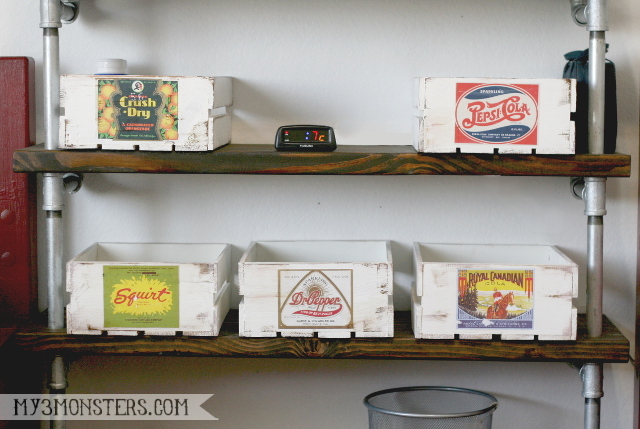 I made several more Vintage Soda storage crates to help the boys keep all their personal effects organized in between their beds. Now when they empty their pockets at the end of the day, they have someplace to put their wallets, loose change and the various and sundry things they pick up in the course of a day. There are even designated spots for the essentials like deoderant and my son's glucose tablets and test strips. Rusty metal boxes and a bull dog to wear their ties when it's not Sunday were a no-brainer. Although, that bulldog almost caused this whole project to crash and burn early on. Let's just say the middle child was not a fan. I'm happy to report he has come around. 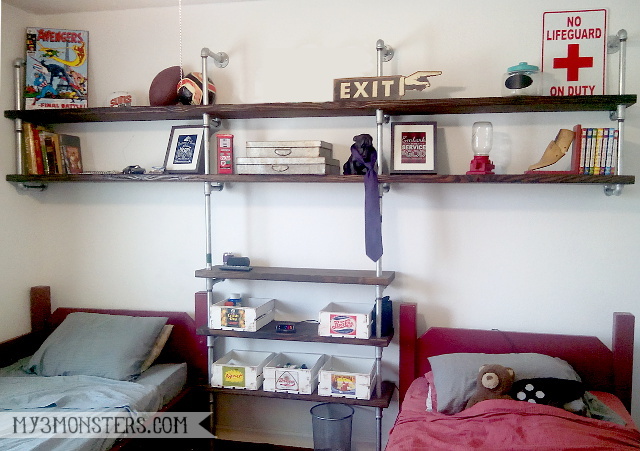 This is one of my favorite DIY's we've done in this house. 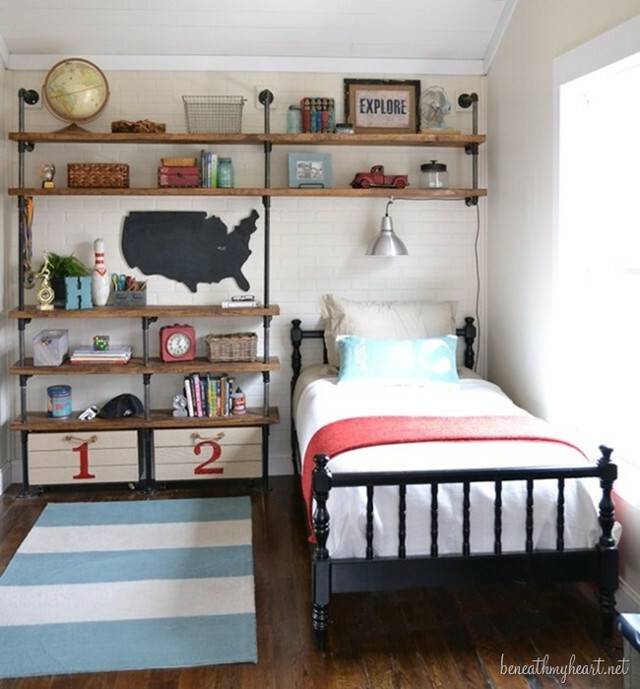 Up next for this room: building new beds that match the shelving unit. I also want to hang a couple of lamps above the beds and make new quilts. Stay tuned for the completed room. What are y'all working on at home?